If you’re in the eCommerce business your website is your lifeblood. And SEO is vital to it. The eCommerce world has become a cutthroat arena for businesses. Most niches are overcrowded. Everyone wants to be ranking #1 in Google and will do whatever it takes to get there. When you slip up, not only does it undo the progress that it took weeks or even months to achieve, but while you’re scrambling to recover, the other guy is profiting. You cannot afford that. Whether you’re in the process of starting a new eCommerce business or your business is already up and running, this eCommerce SEO checklist describes what you need to do to get ahead of your competition. The checklist is platform agnostic, so whether you’re on Magento, WooCommerce, Shopify or some other platform: the same best practices apply. After you went through the eCommerce SEO checklist you’ll understand what you need to do to get ahead of your competition. Some sections are technical in nature, so they can easily be shared with developers to implement the best practices. What keywords are interesting for your business? How to include these keywords in your website? What pages do you have in your website, and how do they relate to one another? What technical constraints to abide to to ensure that search engines go through your website like a knife through butter, while having a firm understanding of what your website is about. Don’t let SEO be an afterthought: slapping on some SEO after your website is released often leads to a Frankenstein website. Instead, use this SEO checklist to make sure you're doing everything you can to maximize the efforts you put into your eCommerce business. Before we get into website structure and the technical side of things, first we need to establish what keywords your target audience is using when searching for the products you offer. Figuring out what keywords are actually used by your audience, and which ones are most interesting to incorporate into your website is called keyword research. These keywords fuel your entire SEO strategy, so it’s absolutely essential that this is done right. To prove our point, the next section on this checklist, Information Architecture, heavily relies on that keyword list. To give you the rundown on how this process works, I’ve put together an extensive guide on keyword research. Use its step-by-step instructions to build the list of keywords you want to target. Again, and I can’t say this enough: the keyword list fuels every aspect of SEO. Make sure you only target keywords that are within reach. Sure, you may have the ambition to rank for very competitive keywords right from the start but that’s just not going to happen. You have to be realistic, and pick your battles. You’ve got a list of interesting keywords that you want to rank for, so now what? In order for you to rank for these keywords, you need to have pages where you can incorporate these keywords. First, you need to map the keywords to pages and second you need to define how to incorporate the keywords. Incorporating keywords in pages is done by including keywords in important HTML elements, the body content and links. All this results in something we call the keyword strategy. Now we start the mapping process. Fill in the columns “URL” and “Keyword #1” and “Keyword #2”. Don’t try to incorporate too many keywords per page, in most cases two keywords is the maximum. Group related pages in subdirectories. Example: “led tv samsung 40 inch”, “led tv samsung 42 inch” and “led tv samsung 46 inch”. Keywords with a high difficulty score need to be mapped to strong pages within your website, pages such as your homepage and category pages. Example: “television” has a high difficulty score. Map this keyword to your homepage since it’s your best bet to be successful with ranking for this keyword. Soon you’ll see your website structure taking shape. You’ll also see gaps in your keyword research list. For instance: you included the keyword “smart tv samsung”, but forgot to include the generic keyword “smart tv”. Add it to your keyword research list, and fill it in in the keyword strategy spreadsheet. You see people are searching for combinations of one brand’s television types and sizes. They’re probably searching for the similar keywords with the other brands too. Incorporating keywords in pages is done by including keywords in important HTML elements, the body content and links. Now define the contents of the other columns “Title”, “Meta description”, “H1 heading” and “H2 heading”. Incorporate the keyword at the beginning of your title, H1 heading and H2 heading. If you can’t incorporate the exact keyword in the title or headings then don’t force it in. Choose whatever is best for your visitors. If you have multiple H2 headings, don’t try to force in your keyword in every H2 heading. When defining the titles, meta descriptions and headings, think about your visitors. What triggers them to request more information, or, even better, make a purchase? Is it price, delivery time, or personal advice? Try to weave the (potential) answers to these questions into the content in these columns. Pro tip: use templates to generate the contents of the title, meta description and headings. Make sure you can manually overwrite the generated contents. Good templates will get you 90% of the way, but the remaining 10% often needs manual adjustments. Looking for $productName? Only $productPrice at $companyName. Order today before 9 PM, delivery next day. Image optimization plays an important role in on-page SEO too, but we’ll touch on that a little later. On eCommerce websites, body content is often placed above and/or below the products. Body content gives search engines a better idea of what the page is about, as well as a clear signal that the page is unique and needs to be considered for indexing. Without this context, search engines have trouble understanding what pages are relevant for what keywords. Amazon deliberately chose to place the body content below the products because they didn’t want the body content to push the product images down the page. They wanted the best of both worlds: to give their visitors the opportunity to dive into their products right away (good user experience) and offer search engines a clear context for this page (good SEO). Add body content to all of the pages you want to rank for in search engines. Be pragmatic and apply the 80/20 rule. Start by adding body content to your most important pages. Often these are the homepage, category pages, subcategory pages and your top product pages. After that’s done, continue with the rest of the pages. Body content should be unique for every page and consist of at least 200 words. Again, don’t force usage of exact keywords in the text. If it doesn’t fit, it doesn’t fit. Focus on writing useful content for your visitors. Explain what types of products you’re offering, what’s so great about them, and what they should keep in mind when evaluating them. Mix singular and plural forms of your keywords. Include related keywords and links to useful content. Links play a vital role in SEO. Because navigational elements like such as the main menu, footer menu and breadcrumbs include links, these play a vital role too. Incorporate keywords in the link texts of the links in the navigation. Try to incorporate the exact keywords, but again don’t force them in. Choose readability over SEO. Focus your navigation to link to important, relevant pages. Link from your homepage to the category pages. And from your category pages to your subcategory pages. Are some of the category pages related? Then link to one another. Information Architecture is the art and science of designing a structure for presenting your website’s content. In a nutshell, it’s about defining what content will be presented and how it will be made accessible. Information Architecture is essentially where User Experience meets Search Engine Optimization, and both visitors and search engines will benefit from a well-crafted design. Content Inventories, commonly maintained in spreadsheets for tracking the most important pieces of information for the essential pages of the website (the purpose of the page, the title, a short description, its relation to other pages, etc.). While your situation may not call for all these deliverables in high fidelity, it is always important to think about the essentials. The information architecture is the foundation of your eCommerce website, so you need to make sure it’s solid and allows for expansion in the future. The last thing you want is to paint yourself into a corner. Keep these aspects in mind during your planning and you have 90% of the best practices covered. In your Keyword Strategy you’ve already thought about the role of the navigation from an SEO point of view. Now let’s fill in the blanks by looking at it from a user point of view. Describe all of the pages you want to include in your navigation and add hierarchy to them. Choose page labels that include important keywords and that make sense from a user’s point of view. For eCommerce websites with a lot of products it doesn’t make sense to define the properties above for each individual product category and product page. The goal here is to get you thinking deeply about the whole process, and along the way it’s likely you’ll come up with a template that applies to a lot of product categories and pages. I recommend defining the properties above for at least your most important product category pages. 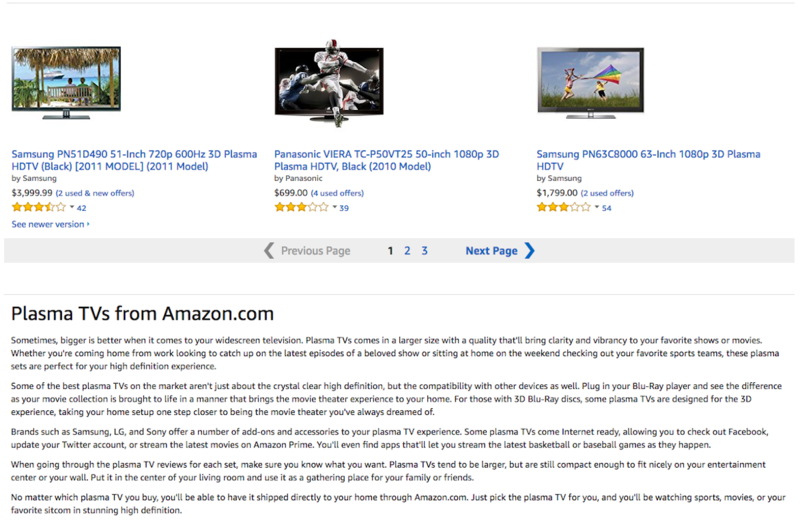 When it comes to product pages, it’s a good idea to at least define them per product category. Choose your product names wisely. Ideally they are the same or at least very similar to the queries users would use to find your products. Optimizing your product images for search engines is a no-brainer for eCommerce websites. If done well, image optimization can drive solid traffic that converts. A general best practice is to offer the right image size for the right device. This means high-quality images on desktop and lower quality images on mobile. Quickly gain insight into your eCommerce architecture with ContentKing! …you don’t want to miss this FREE E-BOOK if you want your online business to be successful.